A spritz of perfume always adds the finishing touch to an outfit. Whether your style is sporty or girly there is a fragrance out there just for you! Read on to learn about 3 hot scents that are perfect for your personality. FOR THE GLAM GIRL… You love anything glitzy and glamorous. From sequins to glitter, your personal style says “superstar." This fall, spice up your style with “Fantasy” by Britney Spears, “Viva La Juicy” by Juicy Couture and “Glamorous” by Ralph Lauren. All three of these fragrances are perfect for a girl like you who loves all things chic. FOR THE SPORTY SWEETHEART… Yoga pants and tank tops are totally your thing! You are always in and out of the gym, and your clothes reflect a girl who stays active. This fall, give your fashion sense some flair with “Touch of Pink” by Lacoste, “Fruity Rhythm” by Adidas and “Free Flowing” by Puma. All three of these ultra-athletic fragrances will have you feeling fabulous all autumn long! FOR THE GIRLY GIRL… Bring on the velvet, lace and bows. You are feminine when it comes to fashion! 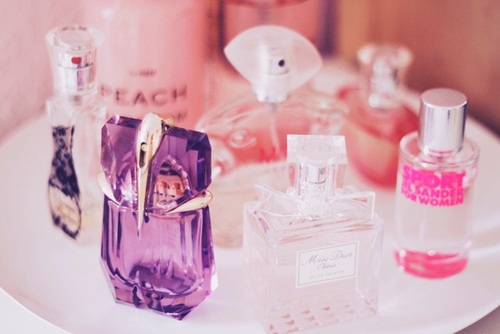 You love all things pink and are looking for three amazing fragrances to suit your style. This fall, try wearing “Oh Lola” by Marc Jacobs, “Miss Dior Cherie” by Dior and “Wonderstruck” by Taylor Swift. These soft, sweet scents will suit your style and have you feeling amazing. I think I am the rebel rocker! My style is pretty cutting edge. Thanks for this article, it was really cool. Neat writing.The pictures are pretty and the perfumes are very cool. First off i just want to say that i absolutely love college gloss. it is a really cool website and whenever i am bored i just read all the neat articles. this article has been one of the best ones yet. i love the way there is a suggestion for each one of the personalities!